"So don't worry. I just need a small amount. Just enough for the bare necessities. Hmm. Well...no. Money corrupts man. It softens him. So to keep you young and pure, I think I'll take everything." The spaghetti westerns revolutionized the whole western genre. The masterpieces of Sergio Leone, like The Good, the Bad and the Ugly and Once Upon a Time in America are the pinnacle of this style, but many other Italian directors ventured into the American west to find stories of greed and excitement. Ace High, written and directed by Giuseppe Colizzi, is certainly not a work of art like the aforementioned films, but it's an enjoyable exercise in style nonetheless. Those who have seen Leone's "Dollars" trilogy will certainly recognize the technique and plot at work here. Two men ride into a small town looking for a man. The sheriff's department is preoccupied with tomorrow's hanging of a murderer, which enables these two strangers to waltz right into the bank and rob its owner, Mr. Harold (Steffan Zacharias). The two men, Cat (Terence Hill) and Hutch (Bud Spencer), make off with all the money without firing a single shot. But that doesn't mean Mr. Harold is going to take this lying down. He arranges the escape of the murderer, Cacopoulos (Eli Wallach), to retrieve the money. But once Cacopoulos is free, he follows his own plans and starts to take revenge on those who framed him for murder—starting with Mr. Harold himself. At this point in time, it is entirely unclear in what direction the movie is headed. Cacopoulos' actions suggest that it will be a revenge picture, but then he robs Cat and Hutch to use their money for the good of small villages. Eventually, Cat and Hutch catch up with this western Robin Hood, only to find themselves involved in a major battle between Mexican and Texan forces. There's no clear understanding of how our trio finds themselves in the midst of this fight, but the battle is a fun exercise in direction. Giuseppe Colizzi and his editor, Marcello Malvestito, use set pieces well to create a geography that allows the audience to comfortably apprehend the action. After the three men get out of the battle Cacopoulos manages to escape again and the chase resumes. Cat and Hutch follow him, meeting a variety of colorful characters, like Thomas (Brock Peters), and eventually the story ends in a boomtown. The men capture Cacopoulos, but they are too late, for he has already lost all the money in a casino. Thanks to Cat's scheming intellect, they devise a plan to rob the casino and its owner�Cacopoulos' archnemesis, Drake (Kevin McCarthy). As preposterous as this serendipitous encounter sounds, somehow it all seems to work within the fabric of the story. Perhaps it is because there's really no story, but rather a collection of images. The cinematography, by Marcello Masciocchi, beautifully captures the Spanish locations on which it was shot, giving a vivid and undeniably authentic look. The only problem with this movie, from an enjoyment stand point, is that it isn't as good as the work of Sergio Leone. Terence Hill's performance as Cat is unmistakably modeled off of Clint Eastwood's performances as the Man With No Name. As a result, Hill is inevitably compared to Eastwood and comes up short. Part of this is a result of him not having the screen presence of Eastwood, but part of it is the writing. None of the three leads, not even Cacopoulos (despite Wallach's zealous performance), are fully developed. Obviously it is a staple of the spaghetti western to cloak the main characters in mystery, but there still has to be an element to them that is identifiable. All that can safely be said about these three men is that they shoot guns and want money. 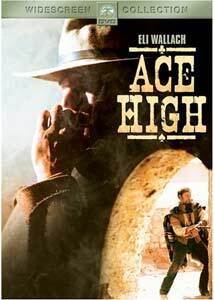 Yet, despite these weaknesses, Ace High remains a thoroughly entertaining affair, even if its plotting is muddy. Apart from an inapt score, by Carlo Rustichelli, the crew's craftsmanship and Colizzi's direction create a gritty spaghetti western. Image Transfer Review: Presented in an anamorphic 2.35:1 widescreen transfer, Ace High looks awfully good. A few shots are noticeably grainier than others, but it isn't enough to be much of a bother. Some print defects and dirt can be noticed, though there's a surprisingly low amount of it. These flaws can be trace back to the age of the film, so it is tough to imagine the picture looking better than it does. Depth and detail are extremely song, as is the contrast. Colors and fleshtones also have a vivid quality, making this solid work by the people at Paramount. Audio Transfer Review: The audio preserves the original mono English mix, but sadly no Italian track is included for die hard spaghetti western fans. Dialogue is crisp and easily understood, with the music and sound effects being well balanced across the front sound stage. It isn't a dynamic mix, but as an effort in film preservation, it deserves compliments. There also is a French mono track available. Extras Review: There are no supplemental material provided for this release, just English subtitles that can be accessed either through the remote or set up menu. Ace High is a solid representation of the Spaghetti Western, despite having a muddy plot. The acting is respectable and the style is worthy of notice, making for an enjoyable experience. The image transfer here is a nice piece of work, as is the mono sound mix. Sadly, it lacks in extras, making this title more worthy of a rental than a purchase.